To evaluate how many patients with peritonsillar abscess (PTA) fulfill sepsis criteria and if there is any difference in risk factors and treatment results between patients with and without sepsis symptoms. We also aimed to evaluate the utility of several clinical and laboratory markers for diagnosing PTA. Study group consisted of 92 patients with PTA undergoing bilateral emergency tonsillectomy. Blood samples, pus samples and clinical data were collected. Patients were evaluated for sepsis criteria based on 2001 International Sepsis Definitions Conference. Sepsis diagnostic criteria were fulfilled in half of patients (51.1%). Smokers (p = 0.016) and patients who had not received antibiotic treatment (p = 0.003) had more sepsis symptoms. Procalcitonin levels were moderate and there was no difference between the groups. In majority of the patients, the pus samples contained undetectable or mild levels of amylase while 12 patients had pus amylase at least twice higher than in blood serum and among them, the levels were remarkably high in 9 patients. Half of the patients with PTA meet the diagnostic criteria for sepsis. The risk factors for the latter include current smoking and not receiving antibiotic treatment before hospitalization. PTA treatment outcome does not differ between the patients with and without sepsis clinical picture in case of surgical treatment. C-reactive protein appears to be better diagnostic marker for PTA than procalcitonin. A portion of the PTA patients have remarkably high amylase level in the pus indicating possible association with Weber’s salivary glands infection. 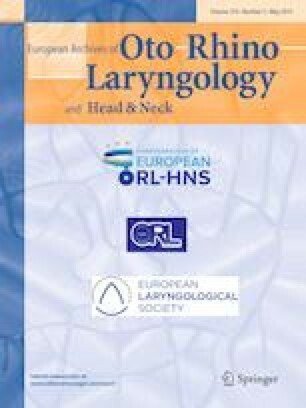 The authors wish to thank Ms. Tiiu Rööp for excellent technical help and Tartu University Hospital Ear Clinic staff for their assistance. This study was supported by Estonian Research Council (Grant no. IUT34-19), Estonian Ministry of Education and Research (Grant no. KOGU-HUMB) and Enterprise Estonia (Grant no. EU48695).